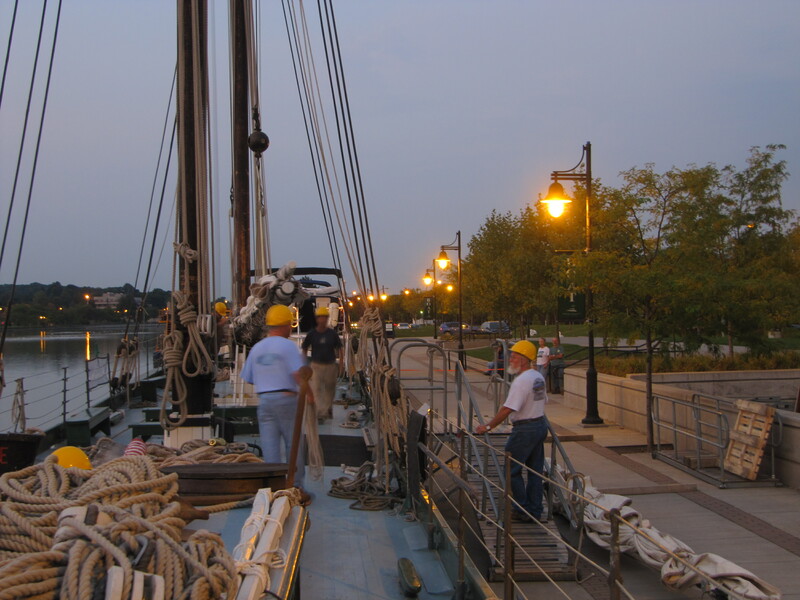 We are docked along the wall on the waterfront of Rochester’s Historic District at Corn Hill Landing. This morning at 6 am, a crane arrived and the Lois McClure‘s crew, with Erick Tichonuk (our first mate) having the additional duty of directing the crane operator, began stepping the two masts. I was especially interested and fascinated watching the whole procedure, which took roughly three hours of hard work. This included the ascent to the top of the foremast by Erick to attach the spring stay (the cable that holds the two masts together) and then his safe descent to the deck. We all were then able to breathe comfortably once again. After the crane left there was another couple hours or so of work to fasten lines down, bowsing the shrouds, and generally make sure everything was secure. By this time, the predicted rain had commenced, so the wet and cold-handed crew was more than happy to come below deck and enjoy hearty bowls of the delicious broccoli-cheddar soup that Kathleen Carney, our Commissary Officer, had prepared. It is amazing how different passers by have reacted since the masts have been stepped. Before, they would glance at the Lois and then continue walking, thinking it an oddly shaped green and white boat no doubt. Now that the masts are up, people stop and and stare at the impressive majestic sight the Lois has become. Many of those who walk by also question any crewmember on deck about the schooner, how it got here, and what the story behind it is. Photographs have also become a lot more common with the masts rising above the buildings surrounding us. For me, watching the change take place was a joy! As many times as I have been a volunteer crew member since the Lois was launched in 2004, I have never witnessed this transformation. It certainly made me stop and think of what it must have been like for my great grandfather-in-law, Captain Theodore Bartley, to step the mast aboard his 1862 class canal boat with no diesel powered crane to help – only his brother-in-law [John] Henry Chubb to help, with block and tackle to provide a bit extra power. It is mind boggling. 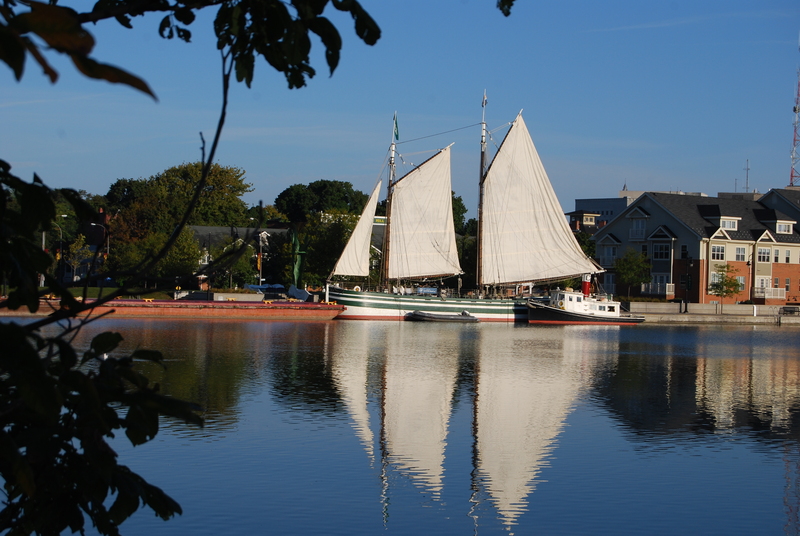 This morning at 7:30, the crew set the sails on the Lois McClure. There are no words to describe the awesome sight that emerged as the sun shone through and on the sails. It sent an appreciative shiver down my spine. Anyone who was watching stood in awe, then grabbed their camera and started snapping pictures. Sadly, we could not leave the sails up but had to lower and furl them before 10am, when the public visitation hours began. Sailing canal boats, with the mast up and the sails up or down, were not an uncommon sight in the 1860s. However, today it is an experience not to be missed. Barbara Bartley is retired from her various employs, including bank secretary, newspaper typist, deputy sheriff, and jail matron. She enjoys camping, hiking, and visits with her grandchildren, and is actively studying her family’s genealogy. She joins the crew of Lois McClure as a volunteer.